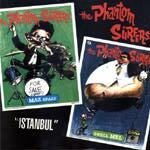 The Phantom Surfers were a capable band that was often buried in muddy recordings. The A-side here sports satisfying sound is satisfying, while the B-side has a really thin sound. A great rendition. The arrangement is almost verbatim from the Renegades Midwest version. Really thin sound and a nowhere riff.